In the Orange County neighborhood known as Little Saigon, signs for political candidates with Vietnamese names line an intersection. The state's growing Asian-American population is expected to have an impact on the midterms in November. And in historically red Orange County — where there are four races that the Cook Political Report labels as competitive — Democrats are hoping that Asian-American voters could help turn the county blue. According to the U.S. Census Bureau, Asian-Americans now make up more than 20 percent of Orange County residents. Mary Anne Foo, executive director of the Orange County Asian and Pacific Islander Community Alliance, says that many of these families have roots in the Philippines, China, Korea, Vietnam, Japan and more. This has been the case for decades, but the difference now is a greater number of those people were born in the U.S.
"You see more and more diversity here in Orange County," she says, "and you'll see more of a rise of second-generation [voters]." Asian-Americans tend to vote Democratic, according to data from the Pew Research Center, with 65 percent identifying as Democrats or leaning Democratic and just 27 percent who identify as or sway Republican. When Pew first started tracking the Asian-American vote in 1998, 53 percent identified as Democrats compared with 33 percent Republican. While Asian-Americans generally voted Democratic, those in Orange County are becoming even more progressive and politically active than their parents and grandparents, says Alex Kim, a Korean-American Republican who is currently the principal and CEO of Three Kings Public Affairs. He previously worked as a political consultant for Democrat James Hahn, the former mayor of Los Angeles, and former California Republican governor Arnold Schwarzenegger. Among Korean-Americans in Orange County at least, the first generation leans more conservatively for the same reasons that Cuban-Americans and Vietnamese-Americans do, Kim says. Their political views are informed by where they came from: countries torn apart by trauma, war and financial distress. Many of the first-generation Asian immigrants in Orange County are small-business owners running nail salons, dry cleaners and restaurants. Kim says they often use Korean community banks because decades ago it was difficult for them to get loans from American banks. The younger generation also is influenced by their environment, but in the opposite way, Kim says. "A lot of these Korean-Americans that grew up in [the] second generation tend to grow up in urban areas," he says. "Urban areas tend to focus more on progressive thinking than more of the conservative, suburban ideals." For Asian-American voters on both sides of the aisle, one of the key issues on their minds is immigration, Kim says. Many are concerned about President Trump's policies on family separation at the U.S.-Mexico border and "the thought of eliminating" chain migration, he says. "A lot of my relatives came here through chain migration, and the question of workforce and how a lot of the small businesses are [hiring] immigrants coming from that chain migration system," Kim says. "It seems like Korean-Americans, the first generation, still are more majority loyal to Trump. They came here legally, a majority of them, and they believe that what he's doing is fair for the country. But definitely my friends that lean more Democratic or liberal Republicans, progressive Republicans like myself, have definitely some qualms about that key issue." 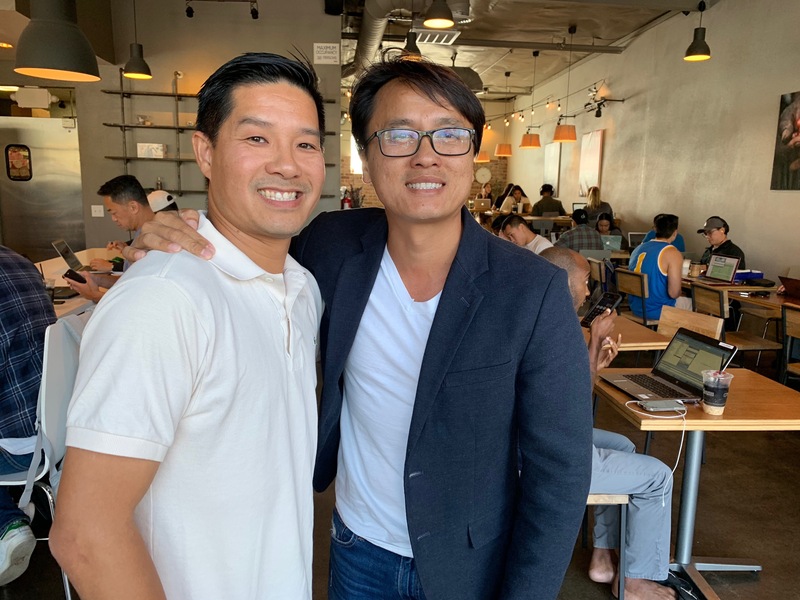 For Vietnamese-Americans in Orange County, the politics also are shifting by generation, say Tam and Sonny Nguyen, Vietnamese-Americans who own businesses in the Orange County neighborhood known as Little Saigon. They were born in Vietnam but raised in the U.S., Sonny says. "So we understand what it means to be an American, but we also understand our parents and where they came from," he says. Tam and Sonny Nguyen, Vietnamese-American business owners in the Orange County neighborhood of Little Saigon, say they see a "stark difference" between the generations not just in their politics, but in how they do business. Sonny says they can see a "stark difference" between the older and younger generations in not just their political views, but in how they do business. Vietnamese-American businesses were historically isolated because their owners came from a country where you couldn't trust the government or corporations, he says. That's why you'll notice a lot of the businesses in Little Saigon are cash only, he adds. "First generations, they're known to be very fragmented, and you don't want to collaborate," he says. "And being an American and having inclusivity, I think that's one of the reasons why we have grown, is because we do collaborate, and we're showing our first [generation], our parents, that look, 'We work closely with the cities. We are sharing our best practices.' 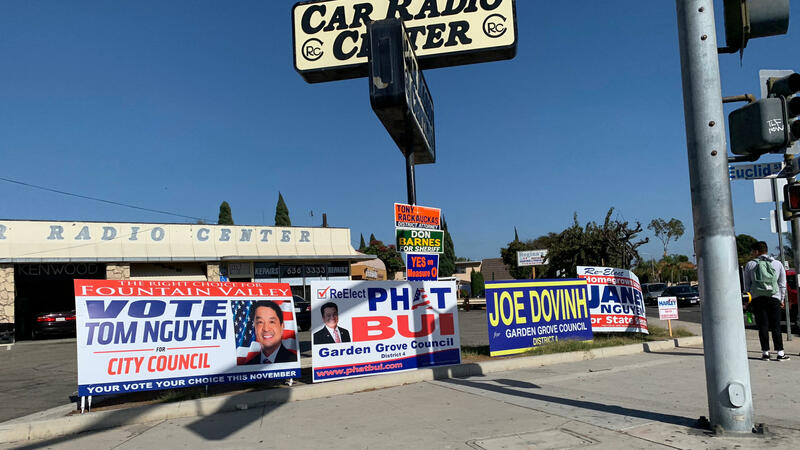 "
On the streets of Little Saigon, the fence at a busy intersection is covered in political campaign signs. Nearly every candidate's name is Vietnamese, but the only Asian-American running for Congress in Orange County this year is 55-year-old Young Kim, a Korean-American Republican who worked for the lawmaker she is running to replace, Rep. Ed Royce. There hasn't been a Korean-American in Congress since 1999, but three are on the ballot this November. Alex Kim says some Asian-American voters are more inclined to support a candidate that looks like them, regardless of party. Even though he's a Republican, Alex Kim is working with a Korean-American Democrat who is running for office in Georgia. "As a Republican, I'm helping a Democrat because it's more not just about party, it's about also this connection, this ethnic connection," he says. "And having not a single Korean-American in Congress right now, I'd rather, it doesn't matter if they're Democrat, Republican, I would like to see a Korean-American on there to represent me." That sentiment is in part a reaction to the way many Asian-Americans have been treated in this country as outsiders, Foo says. They still face discrimination in the workplace, education and housing. "Asian-Americans, no matter how long they've been here, they get the question of you know, 'Where are you really from?' " she says. "I'm fourth generation, my family's been here since 1861, and I still get it. And so it makes people feel that they're not really accepted, or they're not really American." Politicians on both sides have a lot to gain from these Asian-American communities in Orange County, Foo says, adding that those who haven't paid attention to them in the past are now. But if Democrats expect to flip conservative districts in Orange County, they will have to convince Asian-Americans to show up on Election Day. Voter turnout among Asian-Americans has been historically low compared with other groups — just 49 percent in 2016. But Foo says the global political situation across Asia, particularly the trade war with China and the situation in North Korea, is expected to drive more Asian-Americans to vote. "I think that it makes people more interested in voting because they're really concerned about what's going to happen with trade, what's going to happen with the relationships with [their] home country," she says. "So you'll see more people participating."